London broil can be confusing, because it's the name given to a top round steak; it's also the name of a beef dish. As a dish, London broil is so named because of the cooking technique involved. 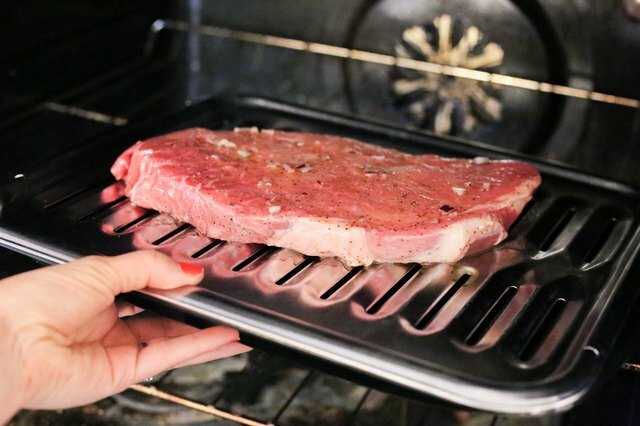 Cooking London broil, either the steak or the dish, in a convection oven means the dish is ready faster and with less fuss -- there's no need to grill or broil the meat. Convection ovens use fans to evenly circulate hot air, so food cooks faster than in standard ovens. 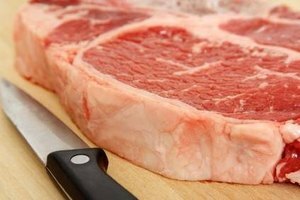 Because the cut of beef used in either case is fairly tough, the dish is economical as it doesn’t matter if you choose to use USDA Select or Angus beef. London broil steak is also known as butterball steak or top round steak. 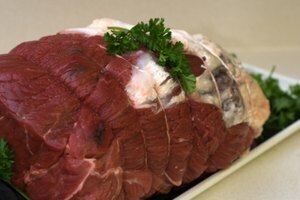 A boneless cut from the back of a cow, this cut of meat has a strong, pronounced beefy flavor. Because it comes from a hard-working muscle, the meat needs to be tenderized with marinades prior to cooking. 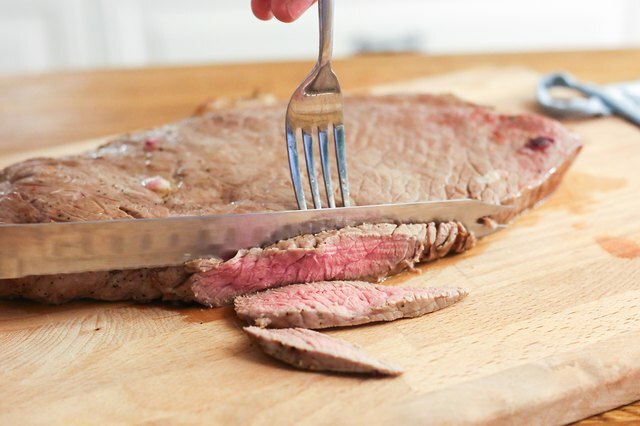 The cooking method known as the London broil -- which is what gives the steak its name, as it's commonly prepared in this manner -- involves marinating the beef to tenderize it, and then broiling or grilling before thinly slicing. 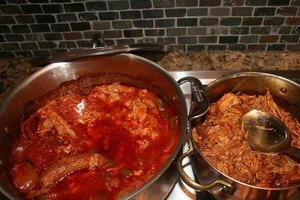 As the meat is lean, marinating also adds extra fat and flavor, preventing the meat from drying out during cooking. 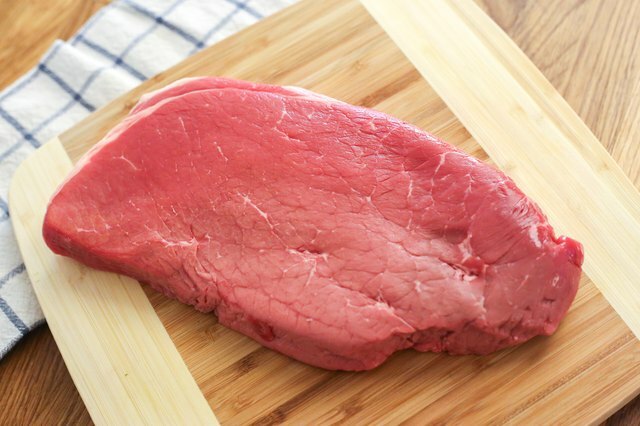 While London broil was traditionally made from flank steak, it's now more commonly made from top round steak. 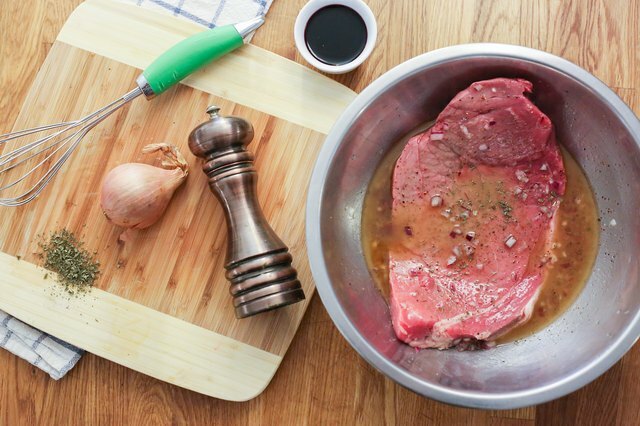 Marinate the steak in a mix of salt, pepper, olive oil and vinegar. You can also add wine to the marinade, along with minced garlic and onions and dried spices. The specific combination of ingredients used can vary according to taste, but always include salt, acid and oil, to tenderize, flavor and coat the meat. A good marinade combination includes using equal parts balsamic vinegar and red wine, along with small amounts of olive oil, salt, minced shallot and garlic and black pepper. Let the steak marinate, covered, in the fridge for a minimum of 20 minutes, or up to 24 hours. Preheat the convection oven to 375 degrees Fahrenheit, and place the steak on a broil pan. Transfer the pan to the center rack of the oven, and cook, uncovered, for 6 to 8 minutes before turning over once, and cooking for a further 6 to 8 minutes. For a 2 1/2 pound steak, this produces medium-rare meat that's still juicy and pink in the center. For rare meat, shave off 1 minute of cooking time per side. To keep the meat tender, slice cooked London broil very thinly, across the grain. Cut no thicker than 1/4 inch per slice. To keep the meat juicy, let the steak rest for at least 5 minutes before slicing, and pour any juices that come out during cutting back on the cut slices. Reduce the marinade with pan drippings until a thick sauce has formed and serve on the side with the sliced steak, along with horseradish, baked potatoes and steamed vegetables. 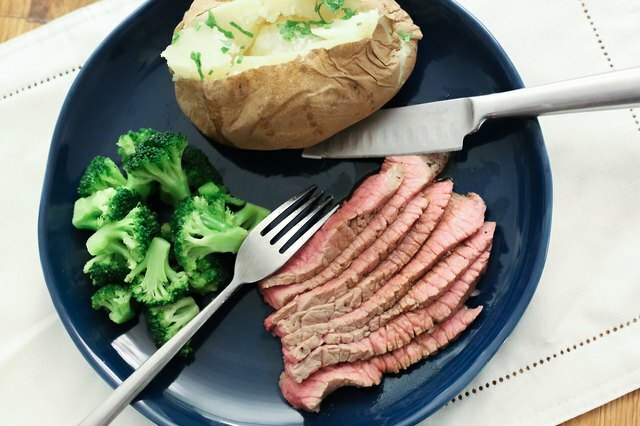 the kitchn: Cheap Eats -- What's the Deal with London Broil? 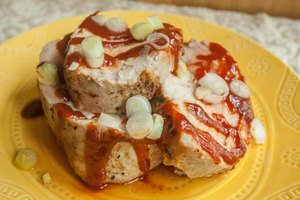 How Do I Know When My Pork Tenderloin Is Done?